This simple fabric recipe makes luscious pumpkin squares. Or with a quick color change, you have blueberry squares or a festive Christmas table accent. This unique set of table linens will be perfect for many table settings. 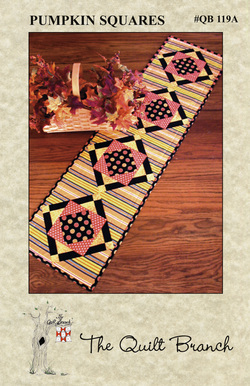 The table runner measures 12¾" x 15", the table topper is 33" x 33", and the placemats are 14" x 20¾".